Fujifilm’s analog frame engagement at its Wonder Photo Shop puts consumers on display. 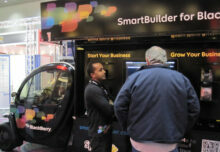 Social media is ubiquitous in experiential marketing, with social media impressions a key metric for marketers. But with the rise of this attendee-driven amplification channel has come hard lessons in letting go—that, unlike photo activation booths, brands can’t always control the visuals or the messages shared. It’s leading marketers to rethink how they design events altogether, designing them specifically for platforms like Instagram, taking into account colors, textures, product displays and the power of the hashtag. 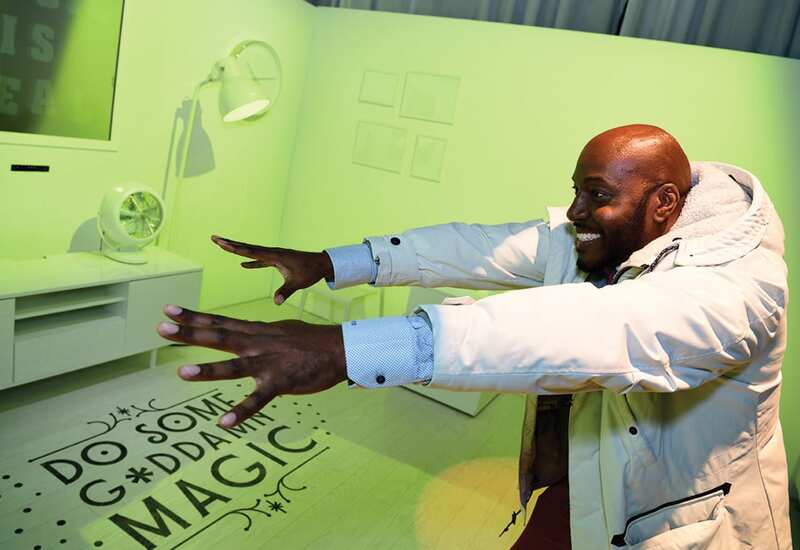 Take Syfy’s Hall of Magicians activation, a 20,000-square-foot experience that ran Jan. 20-29 in Brooklyn, NY, designed to promote the second season of its hip series “The Magicians” among millennials and older audiences (Mash Studio, Brooklyn, NY, handled). The minimally branded space was all about discovery and, yes, magic. There were no solitary virtual reality experiences—only hands-free interactives that allowed attendees to do things like control constellations and “flip” items in rooms, much like the characters in the series do with their magic powers. On top of sharing from their devices, visitors could pick up pairs of Snapchat Spectacles at coat check to wear and snap throughout the experience. The result: upwards of five million social media impressions, and a 33 percent lift in viewership between the first and second seasons. Syfy optimized the space for sharing by excluding tech-heavy intrusions and “friction,” and the stream of shared photos as a result revealed some interesting observations about attendee behavior among the 10,000 who went through the Hall of Magic. “That was magical for us as marketers,” Mohan added. 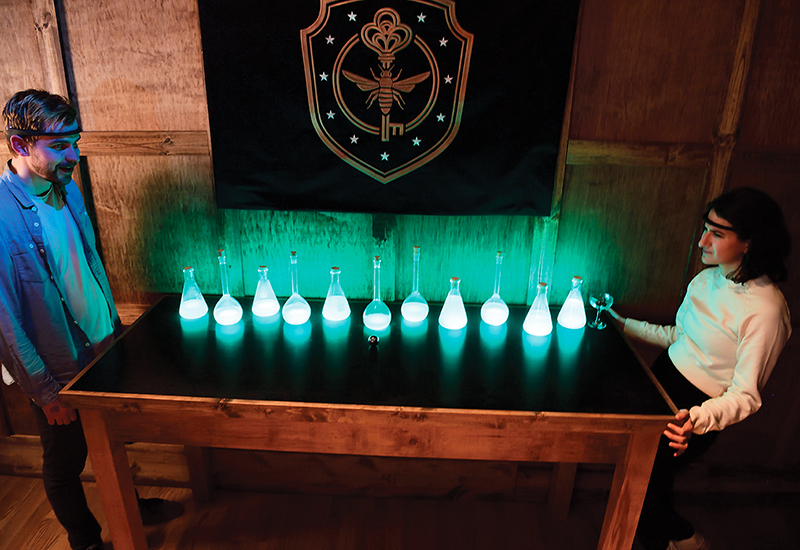 Syfy’s Hall of Magicians experience served up kinetic engagements resulting in hashtag-worthy moments. 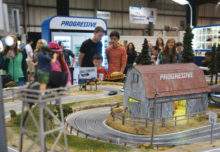 There were 12 rooms for attendees to explore, all jutting off a main corridor, and all featuring “magic” in the form of motion-sensing Kinect technology, motors, turntables and other digital and sensory devices that caused items to move or spin at the flick of a hand, lamps to change color or radio stations to change. All the décor, including the main entry point through a grandfather clock, paid homage to the series. Among the popular rooms was an apothecary shop accessed through a “beam of light,” featuring a shopkeeper actress who pulled consumers in for one-on-ones. Attendees could encounter any of four storylines in the moody space. In a levitation room, there were records and props “floating” off the wall and consumers could try their hands at an old theater trick where they essentially lie back and look like they’re floating midair. In another space, attendees entered a dark forest with mist and lollipops that responded and illuminated as they walked by, and in the back of the room, an abandoned dinner party where the plates and table shook as they approached. In an astrology room, consumers were invited to lie down on a summer lawn scene and gaze up at stars overhead that responded to their movements (like doing “snow angels” in the grass) in real time. Scents by Prolitec enhanced the multisensory experience of the room. Take a look at three more brands with event design strategies worth sharing on Insta. Lancôme last summer introduced beauty editors and bloggers to its new cosmetics lines for the season with Maison Lancôme, an explore-able premium experience at the Academy Mansion in Manhattan (HL Group, New York City, handled). The brand transformed each room with chic themes and photographable moments, like roses dipped in lipstick colors, caviar face cream concealed in an ice block and a beautiful chemistry lab of anti-aging regiments. Plenty of inspiration for Instagram? You bet. The cleverest strategy Lancôme deployed at the event was its Parisian flower market entrance. As attendees walked into the lobby, they were greeted by the scent of freshly cut flowers and a large hydrangea archway. As they left, attendees built their own bouquets as if they were in a market, which were thoughtfully wrapped and completed with a tag highlighting the brand’s philanthropic connection to St. Jude Children’s Research Hospital. The result: even more shares post event. 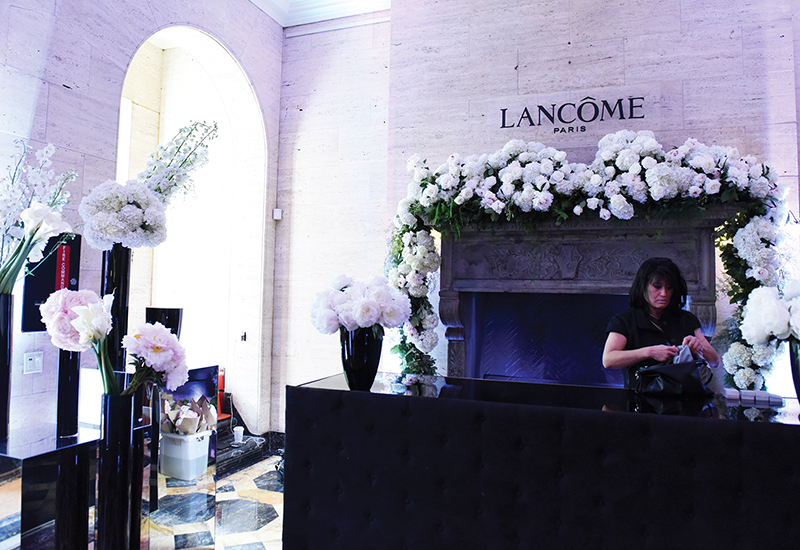 A flower market-inspired entrance set the tone before and after the Maison Lancôme event. Fujifilm’s Wonder Photo Shop in New York City is designed to reintroduce consumers to Fujifilm and support the printable photo renaissance from Instax and other innovations by the brand. The shop is about testing marketing concepts and new products, but it’s also a space for consumers to get inspired (Match Marketing Group, Norwalk, CT, handles). It begins at the storefront window where, inside, a large, branded frame hangs. Consumers can pose behind the frame in the window while someone snaps their picture from the outside. Inside, a chandelier hangs from the ceiling, its branches flush with consumer-generated photos. On top of thoughtfully displayed merchandise, there’s a work station on an apothecary table with scissors, stamps and Washi tapes to transform printed images, and a sumptuous coffee bar and lounge area. Ford brought its sustainability story to life at the 29Rooms event with a lush oasis offset by Instagram-worthy neon hues. Lifestyle site Refinery29’s 29Rooms is an interactive, shareable “funhouse” of style, culture and technology that, you guessed it, features 29 rooms for attendees to explore. With the theme “Powered by the People,” a host of artists and brands got behind the event last fall, sponsoring rooms specific to issues that they support. 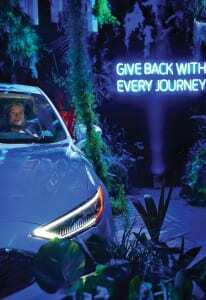 Ford activated a “Garden of Energi” room, spotlighting its new Fusion Energi vehicle. The lush, glowing space infused technology with nature and reinforced the Fusion’s sustainability story. Michael Kors’ room reflected the brand’s “The Walk” campaign, which features diverse women of distinct fashion. Its “Sidewalk is Your Runway” room, with its schematic pink street scene designed to look like the brand’s Bleecker Street location, offered store fronts featuring hanging Michael Kors handbags from the fall season, street signs, shops and flowers and a robot camera—controlled by an iPad. Overall, 29Rooms earned more than 332 million social media impressions. #Success.